We use travel tumblers or mugs quite often at our house. I use one for the water that I drink throughout the day. My husband uses one for his coffee every morning as he is heading off to school. I usually fill one with water for my son as we are heading out to soccer practice. Travel mugs are made to keep whatever drinks they carry hot or cold, and are also meant to keep the drinks from spilling all over the place when you are driving. They make life more convenient, and they are environmentally friendly, replacing paper cups or plastic bottles. As I've said before, summers in Texas are hot. Probably not as hot as Death "Fry an egg on the sidewalk" Valley hot, but that's a matter of opinion. It is simply impossible to keep any cold drink cold in the heat of the summer. The drink in most travel mugs might stay cold for about thirty minutes, until the ice melts, but it is most likely to become lukewarm in second when sitting on a patio or beside you at the pool. Lukewarm tea certainly doesn't taste as good as the iced kind, not to mention the bacteria that starts to multiply in that warm environment. Most of the travel tumblers we have just cannot keep up with the heat, and I'd resigned myself to only the daydream of a nice cold drink on a hot summer day. We took a travel sized Bubba, pictured above, with us to Fort Worth. In the morning, I filled the mug with ice and water, and it ended up sitting in our hot car in the inferno that is a Texas summer for around six hours. When we finally got back to our vehicle, I had no hopes of a nice cold drink, but I was sweaty and parched. Imagine my surprise when, not only was the water still cold, but the tell tale sound of ice was sliding around in the cup as well! You might have met Bubba in his giant sized Keg incarnation, but there are other sizes and styles to fit anyone's fancy. I have not tried this mug with hot coffee yet, but the instructions say that hot drinks will stay hot. The only kvetch that I have with some of the Bubba cups is that they are hand wash only, which isn't really that convenient for me. However, the price is reasonable, and if a person wanted to purchase several mugs, it would be possible to wash all of them at once. Nobody from the company paid me for this post. Nobody gave me a free mug, either, although I wouldn't be unhappy to receive one. I just like the product, and I'm sharing my happiness. 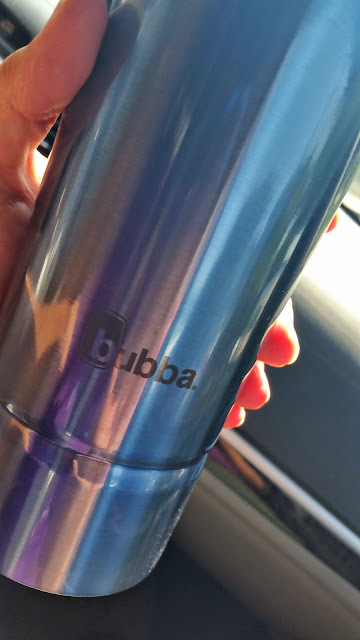 If you're in the market for a travel mug, look for the Bubba brand.